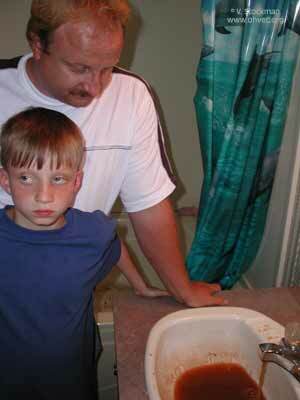 May 29, 2009 by Ken Ward Jr.
Kenny Stroud and his son ponder their contaminated water in their Rawl, Mingo County, W.Va. home.Â Photo by Vivian Stockman. DEPÂ Secretary Randy Huffman says his agency doesn’t have enough information on what water quality was like before companies started pumping this coal waste underground to say for sure if the slurry impacted that water quality. — …There are insufficient surface and groundwater monitoring sample sites to determine effects from slurry injection on surface and groundwater. — Most of the assessment sites lacked detailed information on mine pool conditions and adequate monitoring of the quantity and quality of the mine pool associated with the injection activities. — Due to insufficient groundwater characterization and monitoring by the operators, definitive conclusions could not be drawn on the extent of the effects of slurry injection on the surrounding groundwater regime. — (And my favorite) Operators did not conclusively demonstrate that, when slurry is injected into abandoned underground mines, it remains contained and the surrounding hydrologic regime is not adversely affected. Some of this seems like common sense … I mean, if you want to know if this stuff damaged the water, you need to know what the water was like before the slurry got injected underground. And, you need to monitor the water quality all along the way, right? OK. 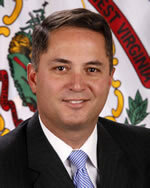 So why didn’t WVDEP make the operators do that? What kind of conditions? Well, for one thing, the WVDEP could have required monitoring and reporting requirements. So, if WVDEP found in this study that it doesn’t have enough information to say if slurry is damaging water supplies, then how in the world could operators have made the showing required under that regulation? 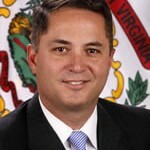 First of all, in our print edition this morning, I wrote the WVDEP had not said how long the moratorium on new slurry injection permits would last.Â Late last night, I got an e-mail message from WVDEP spokesman Tom Auise, saying my story was wrong, and that the DEP news release said it would last for two years. I re-read the news release, and it said no such thing. This morning, I had another e-mail from Tom, saying that WVDEP had originally posted on its Web site a news release including the two-year limit on the moratorium. But, he said, that information had later been deleted, because agency officials had decided not to go with a two-year moratorium. â€œOriginally, the idea was for a two-year moratorium but we ultimately decided that was just an arbitrary period of time that didnâ€™t bear any relationship to environmental protection issues. Certain constituents, such as alkalinity, Total Dissolved Solids, sulfates, and some organics, had migrated from the slurry into the mine pool that received the injection. A comparison of the mine pools in adjacent deep mines where slurry did not occur supports the conclusion that injection activities impact mine pool water quality. Specifically, the water of the mine pool shows increased concentrations of total dissolved solids, alkalinity, and sulfates. Two of the four sites showed changes in water quality of the mine pool receiving injection. Certain constituents migrated from the slurry into the mine pool. …Migration of the constituents from the mine pool to the surrounding groundwater was difficult to determine due to a lack of background information prior to injection and appropriate monitoring of changes by the operator. Are you sure that Mr. Stroud and his son had enough samples to know that their water was contaminated? Did he have a sample of the water from 10 years ago? The scientific method comes into play when it is convenient otherwise it is ignored. Rather, the DEP can take corrective action if it “gains knowledge of a Class 5 well which presents a significant risk to the health of persons . . .” See 12.3 and also 13.1.d of Rule 47. See? So it looks like the burden is on DEP under this rule, not the operator. And this despite CSR 38, which you cite above, and which is cited in report. This burden-shifting business is really confusing, but it seems to me to be critical when you’re talking about an understaffed environmental regulatory agency. I mean really it seems this rule 47 creates an almost impossible enforcement burden for DEP. i’m probably missing something here. And it doesnt’ help that Section 13.23 of Rule 47 creates a great big confidentiality loophole for any permit or application info submitted by operator. When are the people of West Virginia going to wake up and realize that everyone deserves clean safe water? Water is more inportant than coal–always has been and always will be. It is time the people of West Virginia demand that the DEP do the job we are paying them to do–protect us from this type of pollution. If WV DEP hasn’t had clear cut regulations or sufficient staffing for the Underground Injection Control program to safeguard injection of coal slurry, then what is to insure this same UIC program can safeguard the injection of CO2 ? Injection of CO2 is being pushed politically as a way to keep burning coal at power plants, and therefor save the coal industry. But, CO2 would no doubt be much more difficult and expensive to monitor, and potentially much more harmful if it doesn’t stay put. Are the UIC regualtions being rewritten ? Shouldn’t there be a moratorium on injections of either waste by-product until strong new regs and a sufficiently robust staff are in place ? As a resident of Prenter area for 30 yrs I think there should be a permanent moratorium on all injections. They cannot take it back once it’s in the water supply and believe me it’s in there. A new artshow at ReStore in Charleston deals with real WV landscapes and destruction.